The Report Card is a specially designed SchoolCity SUITE module purchased separately by the district, and designed in collaboration with the district. Standards-based grading statements and grading rubrics are variable depending on the district needs. 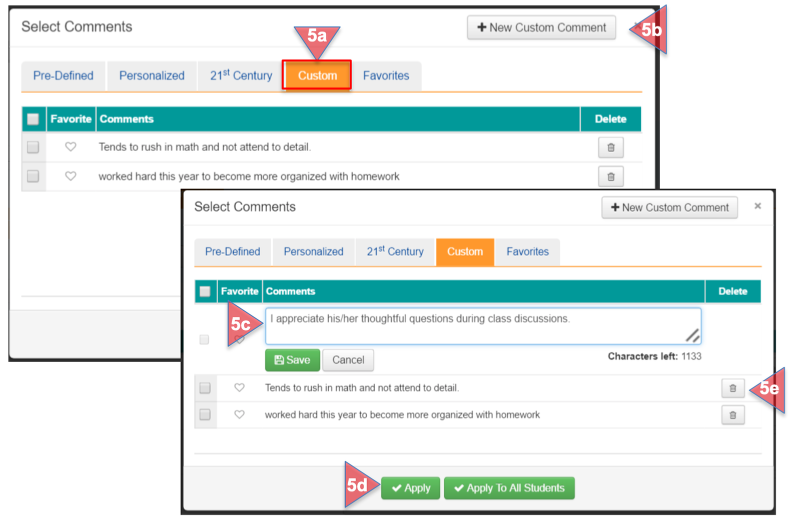 Users can enter grades by student and/or by subject, as well as use predefined and custom comments. This document will review how to enter comments on the report card. Please refer to the Help document, Report Card: View/Print/Enter Grade By Student and Enter Grade By Subject for more information on completing the Report Card. On the flipped side, select View/Print/Enter Grade by Student. In the Report Card home screen, the Comments tab should be selected and highlighted in orange. 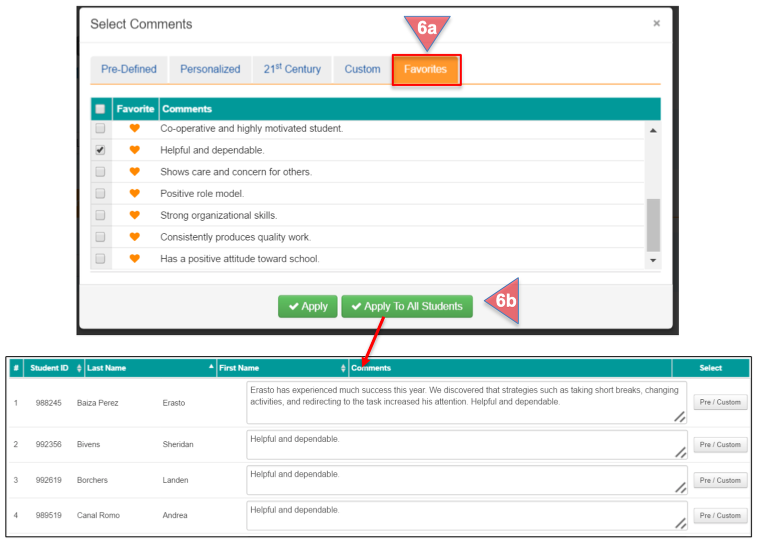 Use the Search box to find a specific student to enter comments. Click Refresh to view results. Select the correct Reporting Period. Click Refresh to view results. Show Inactive Students: Check this box to show students who were on your roster at some point in the school year, but have since been removed. A report card may be required. Comments can be written directly into the text box. Expand the text box by clicking on the lines in the lower right corner, and dragging your cursor to the desired size. Note: You may use a combination of your own comments and pre-defined/custom comments. Select Pre/Custom to the right of the comments text box. Depending on which sets of Pre-Defined comments the district has requested to include, there may be three tabs: Pre-Defined, Personalized, and 21st Century. The Pre-Defined tab includes a long list of comments for your use. You can indicate your favorites by clicking on the heart icon. These will be saved under the Favorites tab. 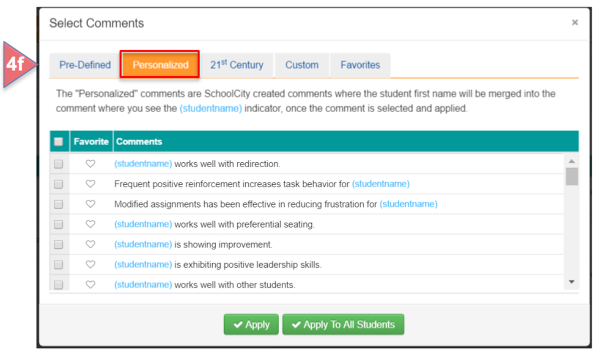 Select a pre-defined comment by clicking in the box to the left of the comment, then click on Apply to add the comment to a specific student’s report card, or click on Apply to All Students to add the comment to all students’ cards. Once the pre-defined comment has been added, revisions and edits can be made within the Comments text box. The second tab, Personalized, includes all of the Pre-Defined comments, but merges the student’s name into the comments. Make your selections the same way as for the Pre-Defined comments. 21st Century Comments are more Pre-defined comments that support Career and College Readiness components in four areas: Critical Thinking, Communication, Creativity, and Collaboration. 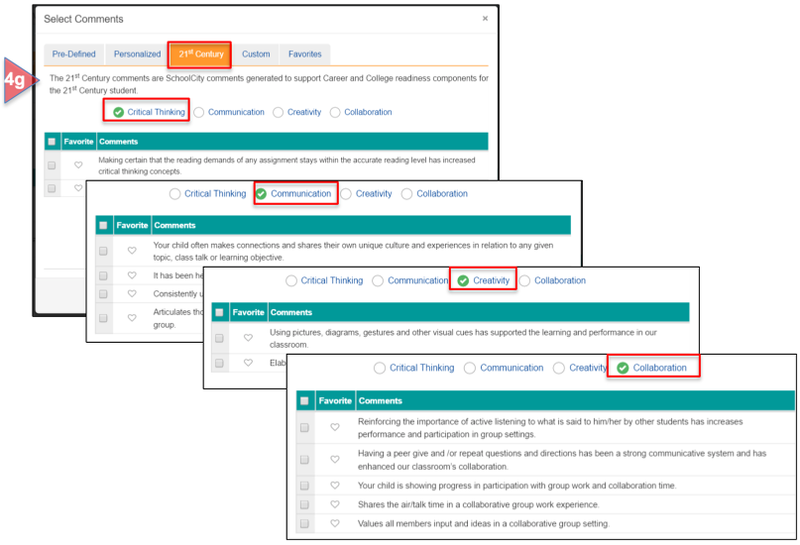 Indicate your favorites, and apply comments to specific students, or all students as in previous steps. The Custom tab houses the comments you have created. Create a new custom comment by clicking on +New Custom Comment. Write the comment in the text box and click Save. 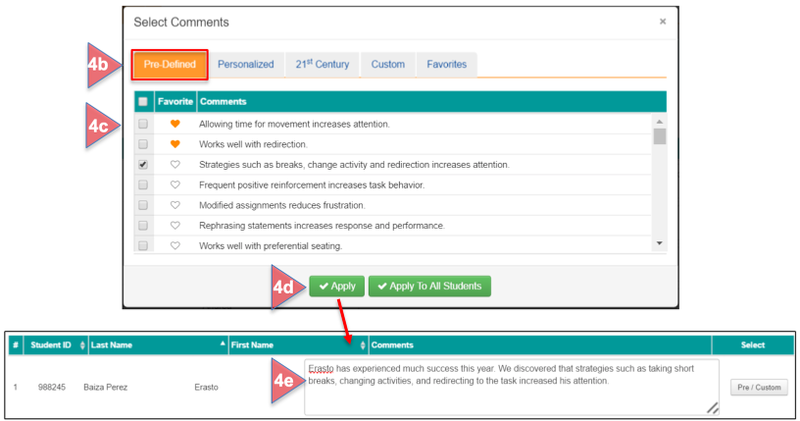 Select a comment by clicking in the box to the left of the comment, then click on Apply to add the comment to a specific student’s report card, or Apply to All Students to add the comment to all students’ cards. Delete comments by selecting the trash can icon. All of the Pre-defined and Custom comments you have previously indicated as your favorites (with the heart) will be housed here. Select the Print button to generate a PDF which can then be downloaded and printed. To preview the entire report card and comments you have made for a specific student, return to the Report Card home screen by clicking on the By Student tab. Click on the printer icon to the far right of the student’s name to generate a PDF which can then be printed.